1. Divide the pineapple cubes between 4 x 250ml ramekin dishes, dariole moulds or cups. Place the oats in a large bowl and stir through the apple juice, yogurt, dried mango and grated apple. Mix well. 2. Spoon the mixture into the dishes and cover the top with clingfilm. Keep in the fridge overnight. 3. Run a knife around the inside of each mould and tip the muesli out onto serving plates so that the pineapple is sitting on top. 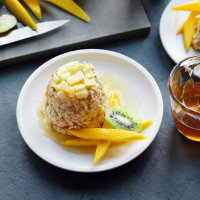 Drizzle with a little honey and serve with slices of fresh mango and kiwi.